Dell R610 Server - Intel Xeon 2x E5620 2.4GHz / 48GB RAM / SAS RAID - 6-Bay 2.5 Drives. System: Dell PowerEdge R610 1U Rackmount Server. Processor: 2x Intel Xeon E5620 2.4GHz Quad Core Processors. Memory: 48GB DDR3 ECC Registered Memory. 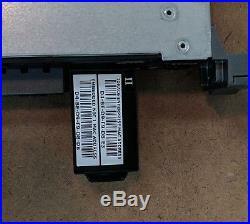 Controller: Dell SAS SATA RAID Controller. Hard Drive Bays: 6 x 2.5. Power Supplies: Dual - Redundant Power Supplies. Keep all original packaging and any pictures of the damaged item and how it was first received if available. Parts or components in units may be non-OEM. Item did not match the item listed details and description. Product matches the item description, however you decided you didnt want it. The product was damaged from negligence after receipt. The item "Dell PowerEdge R610 II Server 2x QC 2.4GHz E5620 / 48GB RAM / 2x PSU/ SAS RAID" is in sale since Monday, August 13, 2018. This item is in the category "Computers/Tablets & Networking\Enterprise Networking, Servers\Servers, Clients & Terminals\Computer Servers". The seller is "electronicsvaluerecovery" and is located in Annapolis, Maryland. This item can be shipped to United States.